From the novice to the seasoned surfer, riding the waves of different locales around the world can be a great reason to book a ticket and just go. You can play out your Kelly Slater dreams from the India Ocean to the Atlantic. And frankly, so many surf boutique hotels have sprung up, lending you even more reasons beyond the water to get away. No longer are surfing getaways about camping on the sand or in the back of a van. Surfers now can have their waves and a nice bed too at a wealth of boutique surf hotels across the globe. Located in the waterside community of Montauk on Long Island, Surf Lodge, from its very name, has cultivated a reputation as a haven for surfers come summertime. The boutique hotel sets up on raw, untouched coastline, lending ideal conditions for surfers. Aside from surfing in the summer months, the area attracts more than surfers, including local fishermen, artists, and travelers. Balancing both relaxation and sophistication, Surf Lodge lends a timeless bohemian vibe. The ocean-inspired accommodations provide a fine getaway to relax and unwind after a day on the water. Surfing lessons are also available for an additional fee at Surf Lodge. In addition to outdoor pursuits, the boutique property also hosts a series of summer music concerts to spice up nights in Montauk. Positioned on Sumba Island in Indonesia, Nihiwatu sits at the door of some of the best surfing in the world. The area attracted Claude and Petra Graves in 1988 in search of the perfect wave. Today the resort provides a much more private surfing experience. Only registered surfers can ride the waves. As you have to have a reservation, surfers don’t have to fight over the waves. In addition to private surfing, the resort also offers private surf lessons, tandem surfing, and tow surfing. The accommodations further the exclusive surfing experience. Guests enjoy all meals included along with Wi-Fi, mini bars, and scheduled excursions along with yoga and meditation classes. Travelers can choose from one to five bedroom villas for their stay. This part of Indonesia also lends a rich culture scene for its isolated location. The island boasts a preserved language, religion and traditional lifestyle for visitors to experience firsthand. The beaches in Los Cabos frequently fall into the good graces of surfers. If you want to explore Los Cabos’ surf scene, check into the Cabo Surf Hotel. Set on a beautiful ocean cove, the hotel sits just 20 minutes from Cabo San Lucas. It features 36 rooms outfitted with satellite TVs, Wi-Fi, and mini fridges. Guestrooms appreciate oceanfront or garden views. What makes the Cabo Surf Hotel especially appealing to surfers is its partnership with the Mike Doyle Surf School. Regular surf lessons are offered throughout the year but normally from March to November. The smaller waves make it possible to learn all year round. If you want some photos of yourself catching waves, you can even hire a professional surf photographer at the school to take your surf session. Board rentals are also available. The Cabo Surf Hotel doesn’t just focus on surfing. Guests can go on snorkel tours and take yoga classes provided by the property. Settled near Peniche, Portugal on the coast and just over an hour from Lisbon, surfers seek out the Surfers Lodge Peniche. Opened by former Swedish national surfing champion John Malmqvist, the boutique property outfits with not just luxury-like accommodations but also its own Surf Academy. Guests can learn how to become a better surfer no matter their level of experience. The academy develops plans and schedules according to your skill level along with the current surfing conditions. You’ll be learning or polishing your surfing skills in a European surf haven. In fact, Peniche hosts the RipCurl Pro each year. Rooms adorn with driftwood touches along with amenities like Wi-Fi, mini bars, and LCD TVs. There is even a Jacuzzi, pool and cozy living room with fireplace for relaxing. In addition to surfing and sleeping, guests are treated at an on-site restaurant serving up local and fresh dishes. Perched along the country’s north Pacific Coast, the Peninsula Papagayo of Costa Rica has come to be a bit of a surfer’s paradise. Thanks to the wealth of waves on the Pacific Coast and renowned spots like Witches Rock and Ollies Point, many accommodations catering to riding the waves have sprung up. Surfers can hole up at Villa Manzu for a private estate experience. The villa lends 8 suites on five acres of isolated peninsula. It features two swimming pools, a spa and theater room. You don’t even have to worry about packing your own surfboard. Villa Manzu comes stocked with a dozen surfboards to use. In addition to surfing, guests can also take advantage of offered excursions to go fishing, sailing, and hiking. Suites come with oversized TVs, plush beds, and mini bars so you can relax after a long day out on the waves. While it might come as a surprise to some, the North Cornwall coast of England is actually quite surfer friendly. Fistral Bay in Newquay, in particular, has made a name for itself as one of the UK’s best surf spots. Close to Fistral Bay is the Watergate Bay Hotel, a less crowded area with gentle waves for beginners. With the beach right at the hotel’s doorstep, guests can enjoy surfing all day and relaxing all night. With a contemporary Cornish flair, rooms embrace coastal colors. Each room is unique, with some offering ocean views. In conjunction with the Watergate Bay Hotel, guests can take surf lessons at the Extreme Academy, one of Britain’s leading venues for beach sports. The academy can tailor lessons to suit your surfing abilities, from beginner to pro. You’ll explore some of England’s best waves and possibly learn a thing or two in the process. Frequently referred to as Surf City, USA, Huntington Beach is usually a must-stop on a surfer’s bucket list. Home to miles of uninterrupted beaches and just 20 minutes from John Wayne Airport, the Shorebreak Hotel lends an ideal surf escape. Guestrooms feature ocean views and sundecks along with soaking tubs, pillow top mattresses, Wi-Fi and flat screen TVs. For surfers, the hotel offers an entire storage area for surfboards. 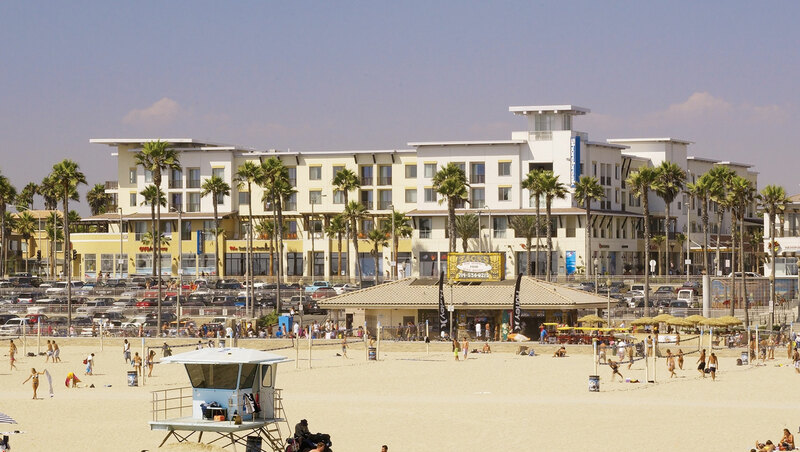 In terms of surfing retreats, the Shorebreak Hotel has a partnership in place with the Huntington Beach Surf School. Lessons are held daily, scheduled around the tides and the water conditions. Instructions are provided for beginner, intermediate and advanced surfers. You can learn or hone your skills where modern surf culture was born. Huntington Beach attracts nearly 50 competitions a year including the famous Vans US Open of Surfing. Set up as a private resort in the Maldives, Gili Lankanfushi comprises of over-water villas made of wood and grass style roofs. Complete with open-air living spaces, a spa and a main restaurant boasting a chocolate cave, you might be wondering just what the resort has to do with surfing. While relaxing and enjoying every comfort is the name of the game, Gili Lankanfushi is also a surfing retreat. Surfing excursions are offered for several hours a day along with windsurfing lessons. The Maldives has become a sort of surfers’ magnet thanks to its great array of left and right reef breaks. The conditions prove ideal for intermediate to advanced surfers. The surf season runs long from mid-February to November. Whether you have been surfing since you could walk or you are just looking to start, these surf based hotels will have you not only riding some legendary waves but also experiencing every comfort and luxury you might need after a long day on the water. Have you found a surf retreat you love to add to the list? Share you pick with us in the comments below.